As a senior at Hagerty High School, Shania Rodriguez loves both art and science. She participates in the Art Honor Society and thrives in her science classes. She plans on applying to the University of South Florida, University of Florida and Florida Gulf Coast University to prepare her for a career in the Environmental Biology field. As the youngest child in a single-parent home, the Take Stock in Children scholarship gives her a path to an Associate’s degree and a way out of poverty. Half Honduran and half Caribbean, she immigrated to the United States 10 years ago with her mother. Her favorite subject last year was U.S. History and her favorite genre of books is mystery or science fiction. 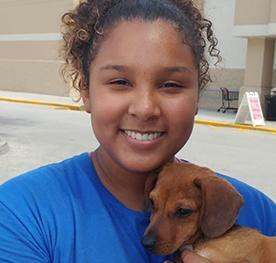 An avid reader, she just finished “The Five People You Meet in Heaven.” Shania is at her local PetSmart most Saturdays volunteering with an animal rescue group to find her furry friends forever homes. Thanks to the support of her mentor and Take Stock, Shania is college ready and college bound!